Apple’s iCloud Internet service already keeps a copy of everything you purchase in the iTunes Store, App Store, and iBookstore. However, what about those songs you downloaded from someplace else or those CDs you ripped? The iTunes Match service can match most, if not all, of the songs in your iTunes library and keep a safe copy in iCloud. iTunes matches the songs with versions from the iTunes Store encoded in the AAC format at 256 Kbps (iTunes Plus setting), which may be a higher-quality format than the version you have on your computer. If iTunes Match doesn’t find a song, it automatically uploads the song as is, directly from your iTunes library to iCloud (as long as the song meets “certain quality criteria,” according to Apple, and is not over 200MB). Songs encoded as ALAC, WAV, or AIFF are transcoded in iTunes to the 256 Kbps AAC format when uploaded to iCloud. To subscribe to iTunes Match, click iTunes Match at the top of the right column of links on the Store home page (or choose Store→Turn On iTunes Match) and click Add This Computer. Follow the instructions to enter your Apple ID and password, and click to agree to the iTunes Match Terms and Conditions. While the matching part of the service only takes a few minutes as it locates versions of your songs in the iTunes Store, uploading the songs that are not available in the iTunes Store can take hours. 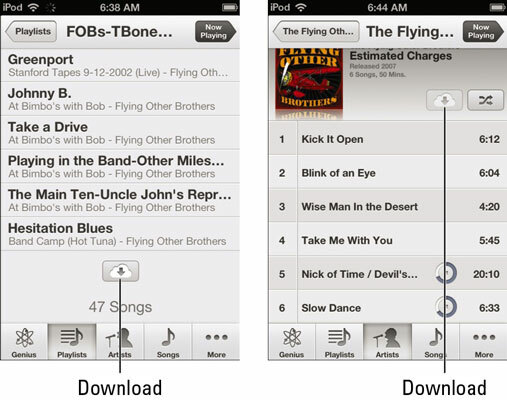 The benefit is that your songs are always available to download — you can access your iTunes Match library on your iPod touch, or on an iPhone, iPad, or iTunes libraries on up to five computers. After turning on iTunes Match, iTunes automatically updates the iTunes Match library whenever you add new songs. You can turn off this feature by choosing Store→Turn Off iTunes Match. To turn it back on, choose Store→Turn On iTunes Match. To update your iTunes Match library with new music at any moment, choose Store→Update iTunes Match. After storing your music with iTunes Match, you can play the music the same way as playing music in your iTunes library — click the play button. The music streams from iCloud into your computer. By default, the songs in your iTunes Match library appear along with the songs in your iTunes library. You can hide the iTunes Match songs by choosing View→Hide Music in the Cloud. 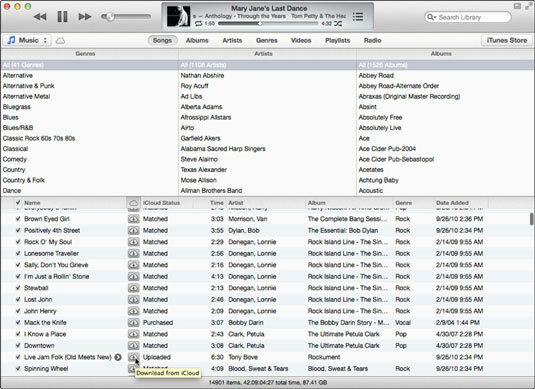 To show the iTunes Match songs again, choose View→Show Music in the Cloud. You can also download a song to your iTunes library by browsing under the Songs tab and clicking the iCloud icon next to each song in the iCloud Download column — the column with the iCloud icon as the heading. If you don’t see this column, choose View→View Options, and then select the columns that you want to appear from the View Options dialog — select iCloud Download, and while you’re at it, select iCloud Status. Choose a playlist or an album. For a playlist, scroll the screen to the bottom to see the download button, which is a cloud icon with a down-arrow. Tap the download button to download the entire playlist. For an album, tap the download button that appears at the top of the album list. As the songs download, a progress circle appears next to each song. When the progress circle completes for a song, it disappears — the song is now on your iPod touch. Cloud with down-arrow: You can download the song to your iTunes library. Cloud with a slash: The song can’t be uploaded. This icon can appear with songs that are larger than 200MB or encoded at 96 Kbps or less. Two overlapping clouds with a slash: The song is a duplicate of a song that has already been matched or uploaded. Cloud with an X: The song was removed from iCloud (but is still stored in your computer’s iTunes library). Cloud with an exclamation point: There is some kind of error with the uploading operation, or the song file has been corrupted. Choose Store→ Update iTunes Match to try to resolve the issue. Empty cloud: iTunes is in the process of matching the song and hasn’t finished yet. No icon: The song is in your iTunes Library. Purchased: The song was purchased from the iTunes Store and automatically copied to your iTunes Match library in iCloud. Matched: The song was matched by a copy in the iTunes Store, encoded in the AAC format at 256 Kbps (iTunes Plus setting). Uploaded: The song was uploaded as is. Songs encoded as ALAC, WAV, or AIFF are transcoded in iTunes to the 256 Kbps AAC format when uploaded. To delete songs from your iTunes Match library, make sure iTunes Match is turned on, and then Control-click (or right-click) the song to see a pop-up menu and choose Delete (or select the song and choose Edit→Delete). The delete confirmation dialog appears. If the song is also stored in your iTunes library, the Also Delete This Song from iCloud option appears in the dialog — select this option to delete the song from both iTunes Match and your library. Finally, click OK to confirm the deletion. This is a nonrecoverable operation — the song disappears from iTunes Match. The song is also removed from your iPod when you sync it to your iTunes library or turn on iTunes Match.